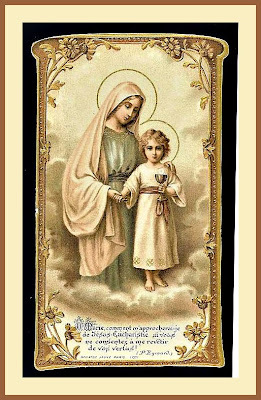 Beautiful holy card...thanks for sharing. The quote is so very true~~Blessings~JMJ~Lisa S.
May we never forget this.Beautiful to live by. The holy card is beautiful! And your message hit me so hard this morning. Last nite I received a call from my friend of 30 years to tell me she is dieing. And I have prayed for her that long that she would let God into her life. It has never happened. But what she has done for me is to let me know that I have a lot to accomplish in the remaining days of her life. Never give up. Our God is a God of Love and mercy. Nothing is impossible with Him. Beautiful, Micki. It is so true. A wonderful reminder! Praying for you and your friend, Mary Lou. Oh Mary Lou, I am so sorry to read this. To have a friend for 30 years is a blessing in itself. Maybe God put you there just so you could pray for her to come to know Him. What sad times ahead for the both of you. I pray that she will maybe hear you even though she doesn't admit it. I also pray that she can still bring you joy as a good friend always does. Stephanie - T Y.........always enjoy knowing you visit here. Gardenia - T Y, as they say, my pleasure. You make me happy just knowing you all care. Contemplar esta tarjeta te lleva a la oracion. By contemplating this card leads you to prayer.